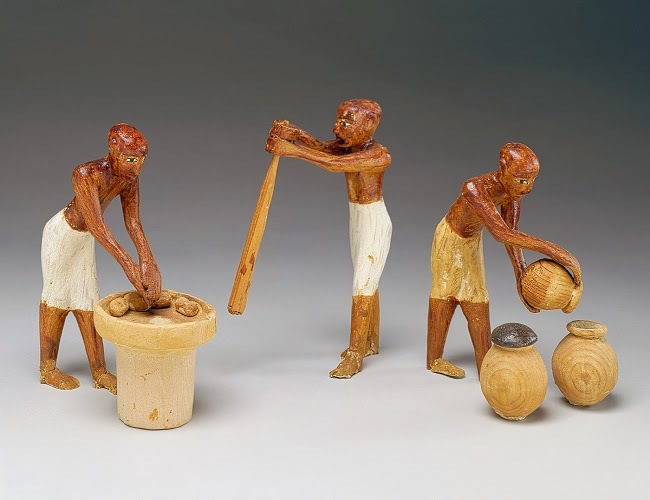 It is no exaggeration to say that beer was of central importance to ancient Egyptian society. 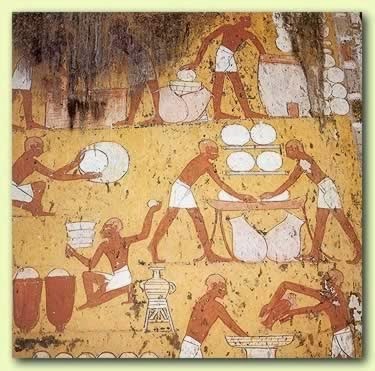 Beer was enjoyed by both adults and children, was the staple drink of poor Egyptians but was also central to the diet of wealthy Egyptians. The gods were often made offerings of beer and beer was mentioned in the traditional offering formula. 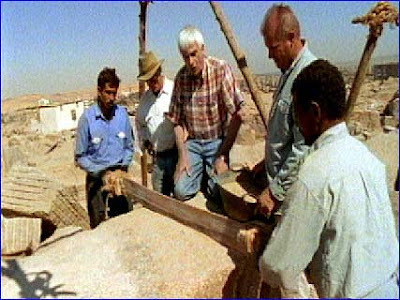 Wages were often paid in beer (and other supplies) and the workmen living in the workers village at Giza received beer three times a day as part of their rations. 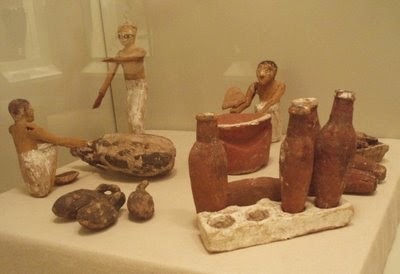 There is some evidence that as a staple foodstuff, ancient Egyptian beer was not particularly intoxicating. Rather it was nutritious, thick and sweet. "strongly influenced by the addition of fruit or spices as flavoring." A beer strainer being used like a straw, straight from the beer jar! 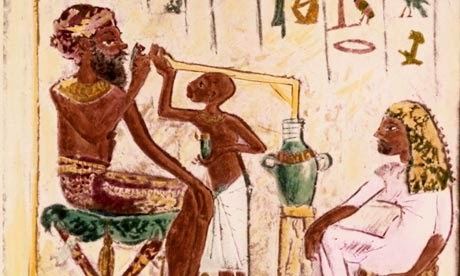 Beer, called hqt by the ancients and zythus by the Greeks, was a very important Egyptian drink. It was a drink for adults and children alike. It was the staple drink of the poor (wages were sometimes paid in beer), it was a drink of the rich and wealthy, and a drink offered to the gods and placed in the tombs of the dead. In 1990, the Egyptian Exploration Society approached Scottish and Newcastle Breweries for help. 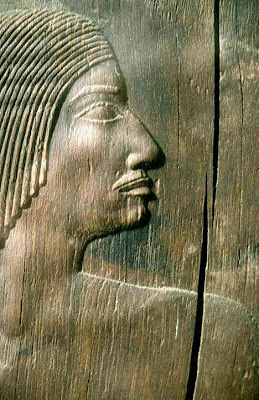 This was the beginning of a partnership which, over the past five years, has considerably increased the understanding of the brewing process as it was at the time of Tutankhamen. Beer was often known as “Hqt” (“heqet” or “heket”), but was also called “tnmw” (“tenemu”) and there was also a type of beer known as haAmt (“kha-ahmet”). The determinative of the word Hqt (beer) was a beer jug. 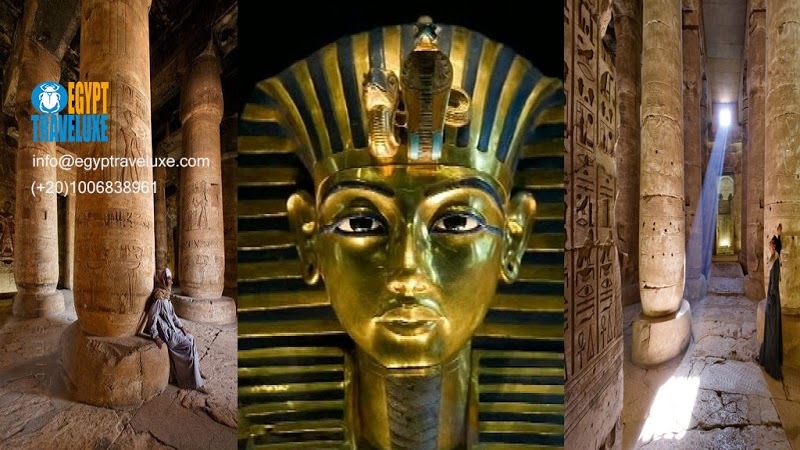 Enjoy a day Tour to the tombs in Luxor to explore with an Egyptologist tour guide more about this article of Beer and Brewery in ancient Egypt .